Josh Fox a filmmaker from Eastern Pennsylvania was in the state mid-June to debut his follow-up to the groundbreaking documentary, Gasland, Gasland Part II. The film will air on HBO on July 8, and many environmental activists are expected to make its viewing a neighborhood event. I attended the first Pennsylvania screening at the Boroughal Middle School in Bethlehem, PA. Expectations are high for the current film, but it will be tough for it to surpass the impact of the original Gasland launch. It was a Tribeca film festival winner and garnered an Academy Award nomination. The film is credited with setting the anti-fracking movement on fire, much like the signature scene of Dimock, PA residents setting their water on fire as it ran out of the faucet. The image is one that truly summed up the frustration and victimization of citizens at ground zero in shale-gas drilling areas. For readers who may not be aware of the practice of hydraulic-fracturing, commonly called “fracking,” here is a brief review. In order to release natural gas from within and beneath shale formations, gas and oil companies drill deep into the earth, sometimes about a mile in depth. The well is then injected with a mixture of at least one million gallons of water, sand, and a toxic mix of dozens of chemicals. The combination in the mixture fractures shale formations freeing natural gas, which theoretically sends the gas to the piping used to extract it. Residents and environmentalists point out the gas does not always march obediently into gas company pipes, instead finding its way into water wells, aquifers and air. Further complicating the issue is the fact water used in this process becomes radioactive and will remain non-potable forever. Radioactive water and chemical combinations are never fully recovered, thus the potential for serious water pollution remains a constant threat. A chemical-induced earthquake is the best summation for such a process. 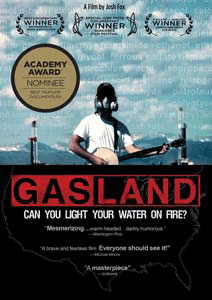 Gasland (the original) showcases the experiences of folks on the ground. It shows the effects of gas drilling on residents and some of the responses from those individuals. While Gasland II also focuses on citizen impact, it is primarily a show of the power of the gas industry and how these interests are served by government officials. More accurately, how politicians feed at the wealthy hands of this industry, and citizens are readily damned. Though shale drilling is happening in many states, none tell the tale of co-opted politicians better than Pennsylvania. Fox shows not only current governor, Tom Corbett, as a shill of the industry, but also exposes former governors, Ed Rendell and Tom Ridge, both of whom have walked out of the Governor’s Mansion directly onto the payroll of the industry. Ridge alone has made nearly a million dollars doing public relations for the Marcellus Coalition, an industry propaganda group. The coalition has recently been encouraging a boycott of 2013 Farm Aid concerts as a result of Willie Nelson joining the ranks of celebrities against fracking. The film shows the frustration of various appointed officials, such as high-level employees of the federal Environmental Protection Agency and PA Department of Environmental Resources (PADEP). These officials seem to want to do what is right for the people and for natural resource protection, yet find they are thwarted by industry money and influence over their elected bosses. Fox also touches on some of the science of alternatives to fossil fuels and theStanford University study led by Professor Mark Jacobson, which shows the US can meet its energy needs from renewable sources such as wind, solar, geothermal, tidal and wave power. Nearly 100% of all US energy, without serious consumer sacrifice, can be accomplished in less than 30 years. One of the most outstanding sections of footage is the flyover Fox and his crew pulled off on July 4, 2010. On that day, Fox was able to fly above the massive BP oil spill in the Gulf of Mexico. It shows the miles and miles of oil streaking, as far as the eye can see, across the Gulf. It is an image unlike any seen on mainstream US media during this crisis. It is an apt connection, not just due to oil and gas both being fossil fuels, but because many of the same firms involved in oil drilling are also cashing in on gas drilling. Frackers use toxic chemicals in the process of hydro-fracturing, while oil companies use “disbursing agents” on ocean oil spills; thus complicating the damage of their spills by adding disbursing chemicals to the mess of oil spills. Gasland II takes viewers through many shale drilling areas in the US. Pennsylvania, Colorado, Illinois and Texas are a few of the stops in the movie, but Fox also shows ghastly impact in Queensland, Australia. His US tour of pre-release screenings have been seen in Illinois, California, New York, Colorado and Pennsylvania. Whether it has the same impact as the original will remain to be seen, however, Fox seems to have the elements for such success in this sequel. Of course, there is flaming water, this time from a garden hose in the Southwestern US, compared to the kitchen sink in the first. However, the favorite scene of this writer is the footage of a Pennsylvania Senate hearing during which a PADEP official is being questioned on regulatory practices. As is often the case, the official is hedging and not really answering the questions to the satisfaction of Senator James Ferlo of Pittsburgh. In his frustration Ferlo sums up the feelings of many of us: “You are not answering the questions. You are an awful witness. You are a really creepy person,” says Ferlo. In all, Gasland II is well done and is recommended viewing for those who wish to understand what all the fracking fuss is about. It works well in combination with the original, or can stand alone.